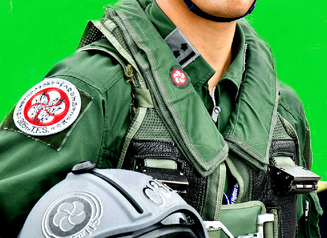 The Aeromiltec Integrated Life Preserver Survival Vest ,refered to as the LPU-44/P is an item of primary survival equipment for a military pilot and aircrew in jets . Providing a full 37 lbs of buoyancy, the inflatable cell - available in manual inflation - is comprised of two independent chambers separated by a fully integrated floating baffle system. This provides for an orally inflated reserve chamber in the event that the primary chamber becomes damaged. Each vest is lightweight - approximately 3.5 lbs unloaded - and contains specific pocket requirements for stowage of survival items such as survival rations, survival kit, survival radios and lights. It is made with a Nomex fire resistant cover and mesh for high durability. As well, each vest is integrated with a lifting harness for over water rescue by helicopter, and contains a buddy line and SOLAS emergency whistle. The LPU-44 offers the pilot and aircrew during ditching at sea sufficient buoyancy and head sustaining, and full mouth and nose over water surface buoyancy. The LPU-44/P unique cell design has been engineered to exhibit excellent self-righting and floatation properties. The sage green fire resistant Nomex III , Aramid container of the LPU-44/P life preserver survival Vest has been designed with pockets for the carriage of US government specified survival equipment. The protective container of the inflation cell is attached directly to the survival vest by means of a heavy duty non corrosive zipper which allows easy removal of the inflation cell container and the use of the Survival Vest only on over land operations. 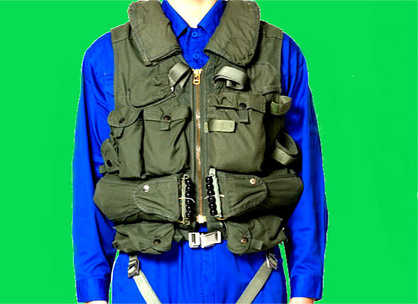 The survival vest incorporates adjustable waist belts of sage green nylon webbing to provide both preliminary wearer adjustment upon donning the LPU-44/P and a final adjustment just before or after water entry provided no automatic inflation environment. The inflation cell contains aviation yellow dye marker and is designed at 275 Newton or 78Lbs single chambered cell. The inflation cell is equipped with a manual activation inflator and an oral inflation tube. An auto inflator type Cobham FLU-12/P is optional beside manual inflation. 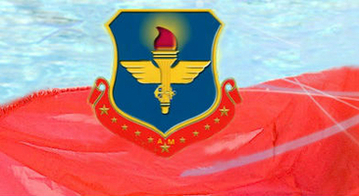 The LPU-44/P is a high buoyancy, twin chamber constant wear life preserver worn byNaval military aviators. It is inflated with two automatic FLU-12/P water activated inflation valves making it ideal for high performance, ejection seat aircraft it can also be supplied with twin manual inflation . The collar and cells once inflated are underarm and the product is derivate of the well known USN LPU-23D/P .